Last week while at Costco wandering the aisles, I’m probably one of the few people who will run into Costco to just pick up a gallon of milk, I found huge bags of stuffing mix for $.97. We’re talking HUGE bags. Like the size of their tortilla chip bags. Seriously, that big. So I picked up several because we love stuffing and this didn’t have any soy or MSG in it. Now I’ve got all this stuffing just sitting in the basement waiting to be used. I’ve also got a bag of fresh spinach in the fridge that needs to be used before it goes bad. 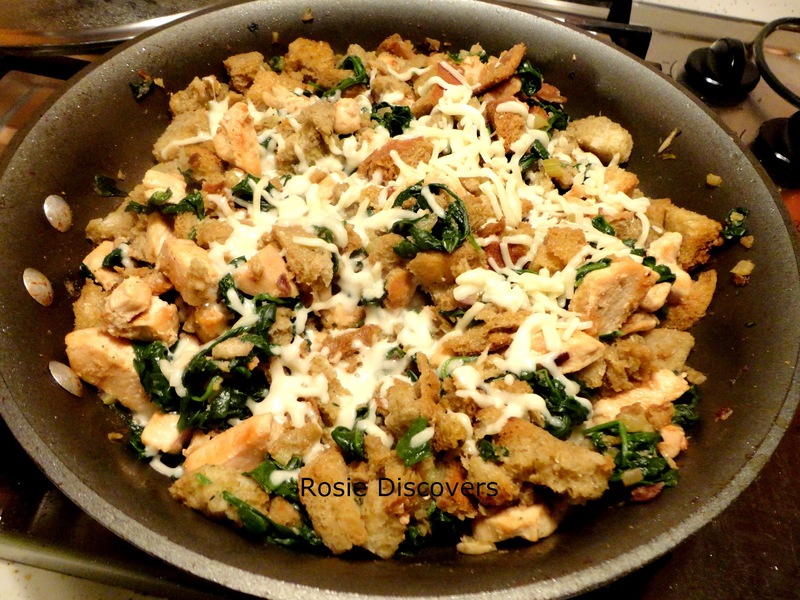 I thought it would be great to have a one pot dish with stuffing, spinach and pan fried chicken. I mean we love all those things, so why not throw them together. I also added a bit of mozzarella on top at the end, but I think in the future I’d just add some grated Parmesan to the top to give it a bit of flavor, but not glop. In a large non-stick skillet, heat 1-2 tablespoons olive oil over medium high heat. When smoking, add chicken breasts. Cook stirring occasionally till browned. Remove from skillet. Melt butter in skillet, add onion and celery and cook till softened. Add minced garlic and cook, stirring till fragrant, about 30 seconds. Pour in chicken broth/stock and slowly add spinach, adding more as it starts to wilt. When spinach is wilted and broth is boiling, add stuffing mix. Stir/toss to moisten stuffing mix. 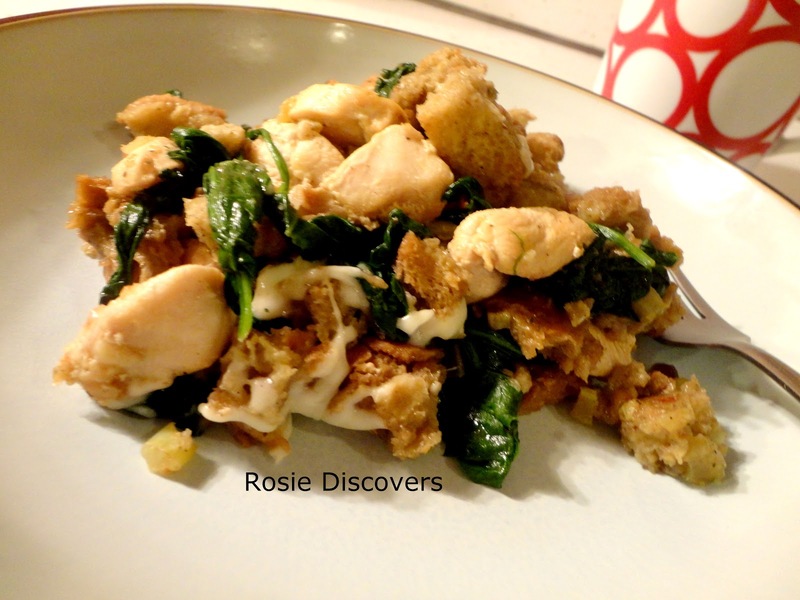 Add chicken back to skillet. Remove from heat and cover. Let sit 3-5 minutes until stuffing has absorbed all moisture. Fluff before sprinkling with cheese. Serve. Makes 4 servings.